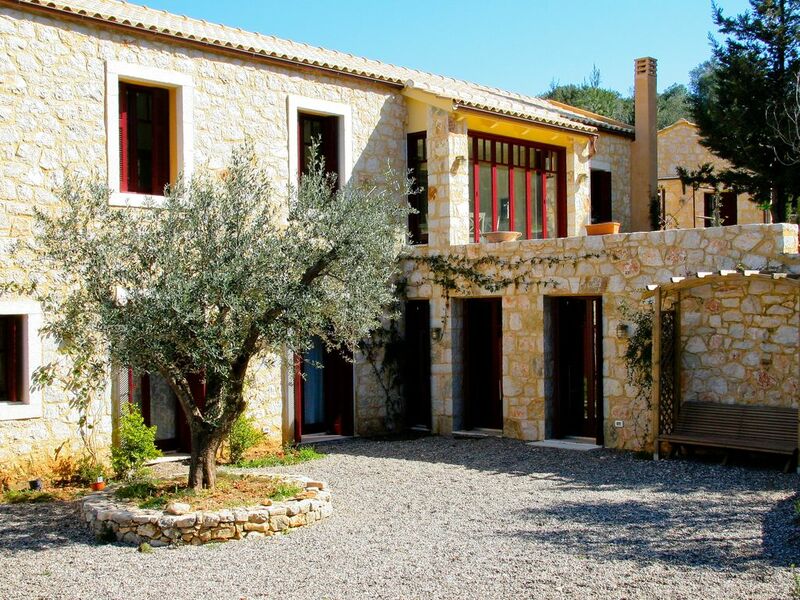 At the edge of Ithaca's capital, Vathi, and only 20m away from the sandy beach of Loutsa, Villa Navalou is situated in a green plot of land that features a private pool surrounded by mediterranean trees & vegetation. The villa is comprised of two structures, a main two-storey residence that features 3 bedrooms with en-suite bathrooms, an additional bathroom in the top floor, a fully-equipped kitchen and a living room area with a fireplace, and a separate guest house that features a master bedroom with en-suite bathroom and its own kitchen and living room. The outdoors area features a lake-like swimming pool and many seating areas in the garden and by the pool, as well as a veranda deck overlooking the entrance of the harbour of Vathi. The property enjoy views to the Ionian sea and nearby islands, while the beach, as well as the town of Vathi are at walking distance. Bicycles are available on site for guests of all ages. Wonderful house on splendid peaceful island! Thank Jack for your kind words.Hope to see you soon!